Where: At the beginning of any road or part of a road. Purpose: To indicate that the road or part of the road may be used by cyclists only. Action:Do not use the road or part of the road indicated by this sign. 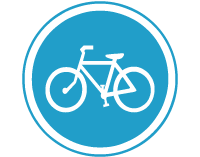 Cyclists may use only the part of the road indicated by this sign.